As part of a collaborative partnership between Mount Desert Island Biological Laboratory (MDIBL) and COSEE-OS, this webinar highlighted eelgrass in Maine's coastal waters. Dr. Hilary Neckles (USGS) shares with us her research on the ecology of eelgrass, its range, its services, its threats, and efforts to preserve it. Her concept map-based presentation includes resources to learn more about eelgrass ecology and conservation, as well as links to educational programs at MDIBL. The webinar has been split into five sections to allow easier access to the materials. Click on the images below to play the movies. All movies are Quicktime format. 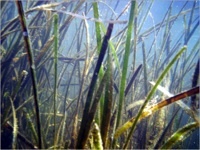 What is eelgrass? Where is eelgrass found? Why care about eelgrass? What is happening to eelgrass? How can we conserve eelgrass? Below is the concept map created in the webinar. You can explore this map within the window, or click on the icon at the bottom left to present the map in its full size.